Self Adhesive - Acid Free - 15mm x 66m PH7 -70 is a white, single sided acid free (pH7- neutral) adhesive paper tape. It is a self-adhesive tape and has a high initial grab, with excellent temperature resistance. This has previously not always been achieved by acid free tapes. 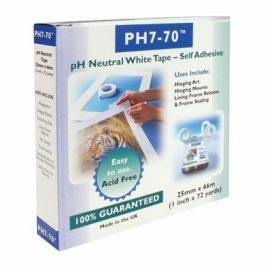 PH7-70 acid free tape uses a water based acrylic adhesive that does not yellow as it ages. The main applications for our PH7-70 Tape are hinging art, the conservation and repair of books, dust sealing and other archival / conservation applications. High quality self-adhesive Kraft Tape is made with 70gsm paper and a very aggressive, non-ageing adhesive system. The 70gsm paper is very flexible and it moulds to the back of pictures very well, producing a neat and professional finish quickly and effectively. This Eco-25 Kraft tape is recyclable and biodegradable, making it a much more environmentally friendly than the polypropylene alternatives. 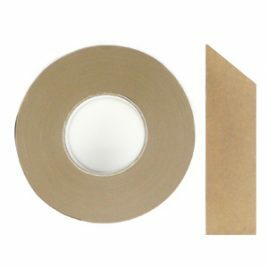 Kraft Paper Tape’s main applications are picture framing and sealing packaging. This Gummed Paper Tape is made with 70gsm paper, which is rolled with the gum side facing in. This tape is for securely sealing boxes or the back of picture frames. Gummed paper tape is the environmentally friendly option when sealing packaging cases, as the alternative plastic tapes aren’t biodegradable. This paper tape also works well at temperature extremes.